Feed-Based Page Layouts offer a more efficient way of working with records. It doesn’t require users to scroll through full page for the information they are not interested in ,to find what they’re looking for. In Simple words Salesforce breaks down Chatter feed track (Feed Tab) and records detail page into different Tabs (Details Tab). Users can easily switch back and forth between the feed view, which includes the publisher and important events on the record, shown in sequential order, and the details view, which shows in-depth information about the record, including related lists. 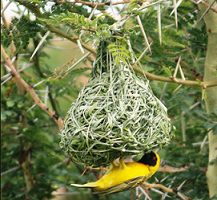 In this demo I used “Demo” custom object. 3) Custom buttons & Links. 4) The record feed which includes activity on the record, such as comments others have made about it.
) and a list of people who follow the record. 6) Feed filters, which let you choose which information from the feed you see. 1) Detail views show in-depth information about the record. 3) Custom Links and buttons (In Detail page). 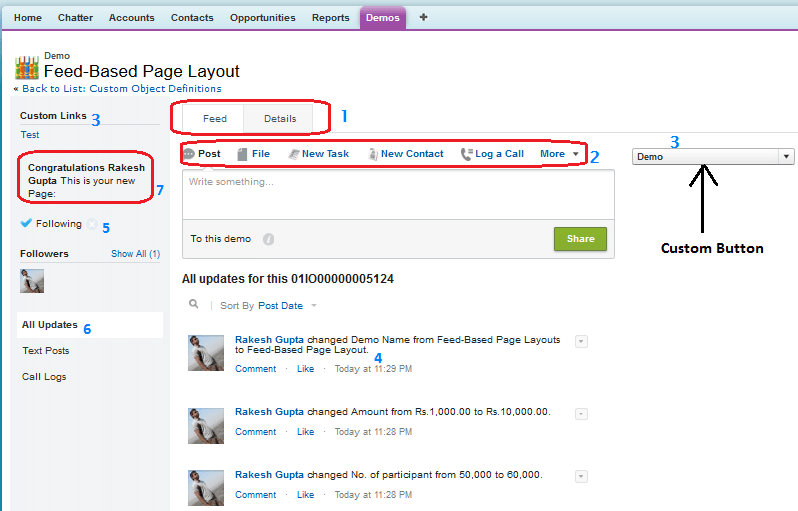 1) Be sure feed tracking is enabled for the object (Demo) on which you want to create a feed-based layout. To do that follow the path Name | Setup | App Setup | Customize | Chatter | Feed Tracking. 2) Create a new page layout and select “Feed-Based Layout” check-box. 3) On the main page layout editor page, customize the publisher action to include the actions you want to make available to users, and add any custom buttons or links. 4) Click Feed View in the page layout editor header to customize what appears on the feed page. 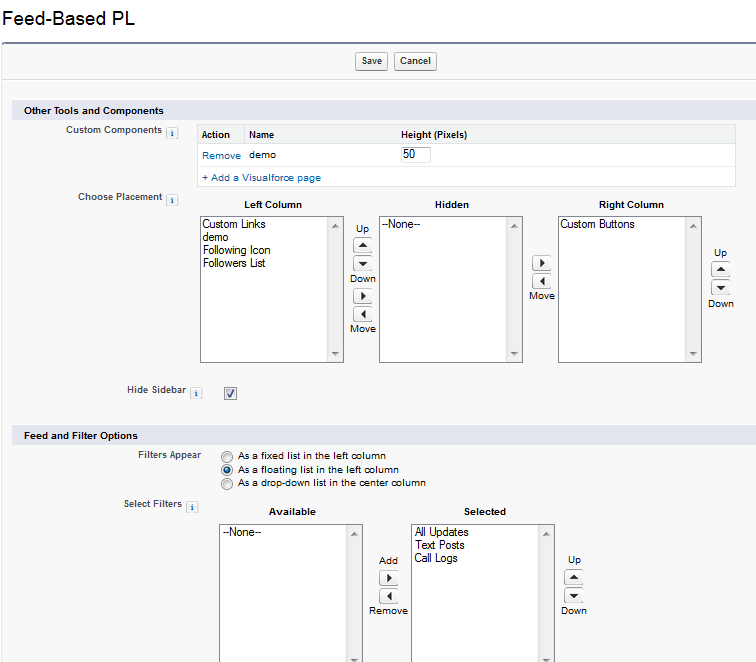 Add custom components, which are Visualforce pages with functionality you define. Choose where on the page custom buttons and links and standard components like the Follow button and followers list appear. Choose which feed filters are available, and where they appear. Finally your feed view page look like above images. Note:- Add your custom Button and Link into page layout, then only it will appear on feed view page.For Visualforce page, Pages must use standard controller of objects for that you are configuring feed-based page layout. 6) Click On Save, to Save Feed view, then again click on Save to save Feed Based Page layout. 7) Finally assign this page layout to user profiles. Announcement:- If you like this blog or you have a question please leave your comments, I’ll try to answer it. Thanks for your time to read my article.